BOSTON, MA – The Travis Roy Foundation announced that it has awarded almost $100,000 in individual grants to spinal cord injury survivors. The announcement was made by Travis Roy, Travis Roy Foundation Founder and Trustee. A Boston-based 501(c)(3) nonprofit, the Travis Roy Foundation distributes grants on a quarterly basis to spinal cord injury survivors in financial need and to research facilities investigating potential cures for spinal cord paralysis. An announcement regarding research grants will be made at a later time. Individual grant funds are awarded to modify vans and to purchase wheelchairs, computers, ramps, shower chairs, and other adaptive equipment to help paraplegics and quadriplegics live their lives. Recipients received grants this quarter for items including wheelchairs, ceiling and vehicle lifts, vehicle hand controls, ramps, exercise equipment, and voice-activated computers. “Incredible adaptive equipment is available, but often times very expensive. 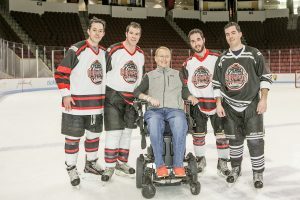 These grants will provide for a better future for people living with spinal cord paralysis,” Travis Roy, Founder and Trustee of the Travis Roy Foundation, said. “We are delighted to be able to give back, making sure that others who have suffered through similar accidents have a brighter future.” A total of 22 individual grants were distributed around the nation this quarter with funding totaling $100,000. Santos – C4 quadriplegic. 17 years old injured from a gunshot wound. His father deserted the family and gives no financial support. Santos needs many things that Medicaid won’t pay for. Currently he only has sponge baths and a reclining bath chair would be a big improvement. The Travis Roy Foundation will provide him with the $3500 chair. Patrick – C4-5 quadriplegic. Injured in a waterskiing accident at age 22, he currently lives in very rural area where it is difficult to find home care. It takes 2 aides to lift him out of bed and back. Recently he underwent flap surgery and they recommended a Hoyer lift for safer transfers. The Travis Roy Foundation will provide him with the $4500 lift. Larry – C5 quadriplegic. Injured in a car accident. Since his van no longer works, at 17 years old he has not been outside the last 2 years and is very depressed. He would like to go back to school, to church, and visit friends again. This $2800 grant will help him obtain a new transmission enabling him to be transported by friends and family. Joseph – T5 paraplegic. Injured as a result of a 15” fall. He lives by himself in a handicapped accessible apartment in same building with his elderly parents. His mother is the main source of transportation but is in failing health. Driving controls would enable him to assist his parents to and from medical appointments and give him freedom for his own needs. The $908 grant will provide him with hand controls. Teng – C3-4 quadriplegic. Injured by a gunshot wound. He lives with his family and is studying to be an accountant. The threshold and floor around his roll-in shower is badly water damaged and will eventually be unusable due to safety reasons. The Travis Roy Foundation has provided him with a $2,000 grant to repair the shower floor. Francisco – C4-5 quadriplegic. Francisco and his wife went camping on their one year wedding anniversary and he dove into a pool, breaking his neck. His wife is now full time care giver. His heavy wheelchair has caused a shoulder injury which is now in need of surgery. Insurance won’t cover a lighter chair. He says the lighter chair would give him more independence, he could move better, give his wife a break on some little things and feel healthier in general. They were granted $4,000 for the new chair. Cleary – T12, L1 paraplegic. Cleary is an architect with a firm in Burlington. After a recent layoff of 15 out of 40 employees, his firm took a 20% pay cut. His wife did is now part-time due to adoption of a baby boy, now 3 months old. He drives and participates in hand cycling, water sports and sled hockey, among other things. He asked for a light weight wheelchair which will make rolling around the often difficult Vermont roads a lot easier. With his current chair over 7 years old and wearing out, he was awarded a grant of $4,000 for a new chair. Brian – C6-7 quadriplegic. Brian makes candles in the basement of his home, which gives him occasional pocket money, and he also donates them to raise money for events in Colchester. He uses a stair chair to get down to the basement, but a recent round of surgeries for a pressure sore that took two years to heal resulted in his Dr. saying he could no longer use the stair chair. A platform lift would allow him to go up and down without getting out of his wheelchair. The Travis Roy Foundation provided a grant for the $13,332 platform lift. Charles – C6 quadriplegic. Charles helps support his young son on his SSDI check. He would like to advance his education to make some more money. He received a $1,000 grant for a computer. Ronald – T4 paraplegic. I remember this was in the paper about 4 years ago when Ronald was in a biking road race and hit from behind by a car. He suffers sleepless nights in an uncomfortable bed which is so noisy it causes ringing in his ears. He is looking into an “Alternating Pressure Bed/Mattress from Medicalairmattress.com which claims to be “whisper quiet. The Travis Roy Foundation provided a grant valued at $1100 for a bed and mattress. Paul – C6-7 quadriplegic. Injured in a car accident, Paul recently received a used van which was donated to “One Nation,” but it is in need of hand controls which he cannot afford. Paul was given a grant for hand controls valued at $2700. Doug – C5 quadriplegic. Injured in an ATV accident. He and his wife had their own business which they lost after the accident a year ago. His wife is going to school to get her CAN and hoping State will pay her to be his caregiver. Married 4 years and sinking in debt with medical bills that insurance won’t cover. Doug was in rehab after surgery for a pressure sore when he wrote the application. Would like a full size hospital bed that he can share with his wife and needs a ceiling lift before he can go home. He was awarded a grant valued at $3100 for a bed and $7300 for a ceiling lift. Travis – C 4-5, quadriplegic. We gave Travis a grant for a computer a year or so ago so he could go back to school, which he attends full time and hopes to continue on to law school. He has a driver/caregiver who takes him back and forth, but the control for his ramp is broken and although they have rigged it up to get him in and out, it is unsafe. The $2,885 granted by the Travis Roy Foundation will ensure he won’t miss any classes. Frederick – T10-11 paraplegic. Fred was recently discharged from Spaulding, who recommended the foundation to him. He is only 24 but had saved enough from his interstate truck driving job to purchase a new home just before his motorcycle accident this past July. He is back with his parents in their ranch home but friends and family are building ramps and helping to make the new home accessible. One of the main things he needs is access to the second level (five stairs) where the bedroom and bathroom are located. The Travis Roy Foundation awarded a $7,500 grant for a new platform lift. Timothy – C 5,6,7, quadriplegic. Tim has injured his head twice, requiring medical attention because of the awkward angle needed to get him into his van. He needed the roof raised immediately and a friend who owns a local body shop did the work for him on a loan for $1524. He will get a grant of $750 through a Catastrophic Illness Program and was granted the other half ($750) from the Travis Roy Foundation. Thong – T12 paraplegic. Thong (Todd) is currently attending school and must be driven by one of his parents each way. He requested a folding wheelchair ($4192) that can be easily put in the car and hand controls ($289) so he can drive himself in one of the family’s two cars. The Travis Roy Foundation awarded a grant for the wheelchair and hand controls. Stephen – C 3-4 quadriplegic. Stephen just turned 17. He was fooling around with a friend and the friend fell on his neck. Dad takes time off from work to transport him 1.5 hr. drive from home to rehab clinic. He suffers from back pain and dizziness from sitting all day. Asking for an Easy Stand which will not only free up extra time at the rehab clinic but will ease his pain and dizziness. They were awarded a $5200 grant for the stander which will allow him to stand for homework, working on laptop and playing video games with his family and friends. Risa – C 5-6 quadriplegic. Risa received a grant about 2 years ago for a bed that would automatically turn her. When she got the grant, she had improved enough to be able to turn herself and asked if she could use the money for several months of therapy at a nearby clinic using the FES bikes. She reapplied for an exercise machine that she could use at home to keep up with the improvement that she had seen. She told me the exercise program completely changed her life – her mental and physical well being – and gave her the kind of hope she never thought she would have again. The Travis Roy Foundation awarded Risa a grant for an easy stand and glider valued at $4167. Jeff – C5 quadriplegic. Injured in a car accident, Jeff’s current wheelchair is broken and he can’t go anywhere. Insurance will not cover a new power chair. The Travis Roy Foundation provided a grant of $6,000 for the power chair. Christian – C5-9 quadriplegic. Product of childhood parental neglect and abuse, he has been in custody of the SS Dept. of Dare County until recently. Christian’s uncle and aunt are now asking custody and modifying their home for him. A lift/ramp system needs to be installed before he can move in. They have raised about $7,000 so far and was granted $4,000 from the Travis Roy Foundation. Robert – paraplegic. At age 22 Robert was in a snowboarding accident. He is currently a full-time student at Champlain College majoring in graphic design and lives independently in student housing. Robert’s current chair is showing stress and he needs a new one to improve his mobility getting to and from school. The Travis Roy Foundation has provided a grant of $6500 for a new chair. Justin – C quadriplegic. A water rafting accident in Idaho had left Justin stuck on the west coast with no airfare to move him back home in MA. With the Travis Roy Foundation paying the $3,443 airfare, Justin’s brother and sister have flown to Seattle to collect him and fly him back to Boston. 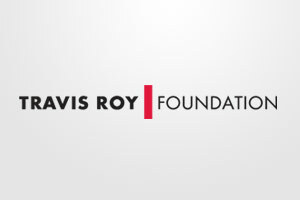 TRAVIS ROY FOUNDATION: Founded in 1997, the Travis Roy Foundation distributes grants to spinal cord injury survivors in financial need and to research projects and rehabilitation institutions across North America. The Travis Roy Foundation is uniquely positioned to touch individual lives with its focus on providing adaptive equipment and sponsoring research. In the US alone, there are approximately 250,000 people currently living with a spinal cord injury and 13,000 new injuries each year. The Travis Roy Foundation could help many more deserving applicants if funds were available. To make a donation to the Travis Roy Foundation or to learn more about applying for a Travis Roy Foundation grant, please visit our web site at www.travisroyfoundation.org.